It is ten after eight on Friday morning and we just got in the car*. I’m feeling very proud of myself because I almost forgot my walking stick but I remembered it just as I was heading to the door. Wait! I say to Sid. I forgot my combadge. We can’t go on a trek without the combadge. What if we need to be beamed up? Besides, I forgot my water bottle too. You know, just your regular trying to get out of the house with ADHD me. So Sid asks where the combadge is and gets out of the car to go get it, along with the water bottle. I’m sitting in the car when I remember something else so I get out, leave the car running and unattended and rush inside. I enter the flat and run past Sid who is in the [open concept] kitchen filling the bottles – his and mine – with water. I don’t bother saying anything on the way in but on the way out I wave the credit card. In case I want to say something, I say. He nods. We head to the door again when I suddenly turn around and run for the kitchen again chanting “I’m sorrys” to Sid. I grab my Juan Valdez mug. All Sid says is “coffee shop?”. I nod. * Oh yeah, I forgot to tell you all I am in Lansingland. After a great time at Fenner, we headed for Old Town in search of Spock… er… coffee. As luck would have it, however, the coffee shop had a bunch of “coming soon” signs. So no coffee for me. 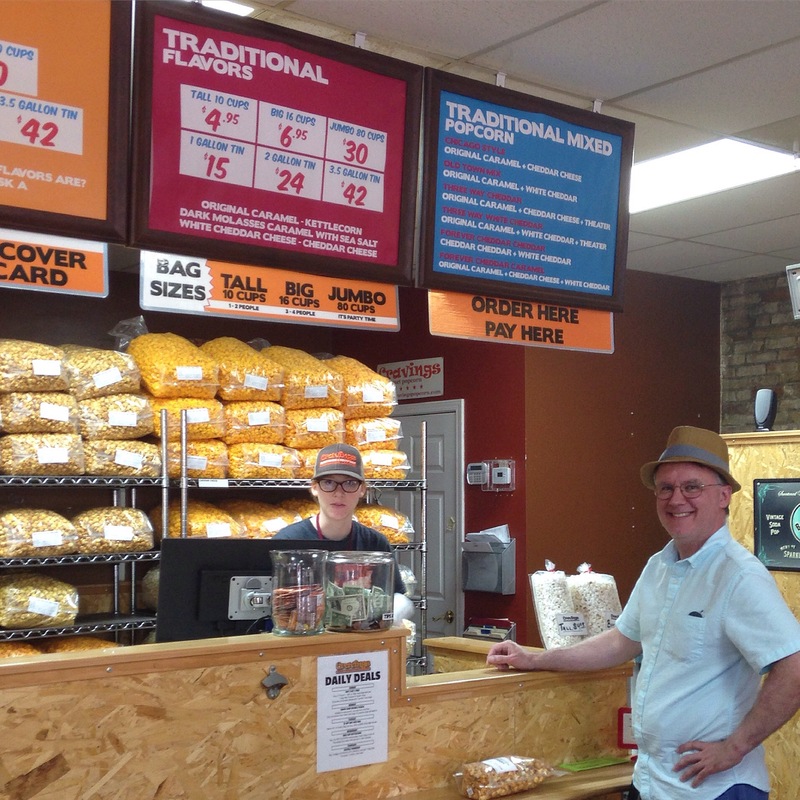 … and got ourselves one bag of cheddar popcorn and one of butterscotch caramel. Yum! Mandatory antique store stop followed. A trove of treasures, that little shop. I got me some vintage buttons that soon will adorn some of my paper-craft projects. Another patron saw me wearing my combadge and asked me if I was a Trekkie. Instant bonding over LLAP! I told her I am meeting Marina Sirtis – a.k.a. Deanna Troi – in two weeks at the Windsor Comic Con and she almost died. She said Deanna Troi is her all time favourite Star Trek character. Then she asked if she could take my picture. If this continues to happen, I’ll have to start charging for it. Happy happy happy you had a fun time!